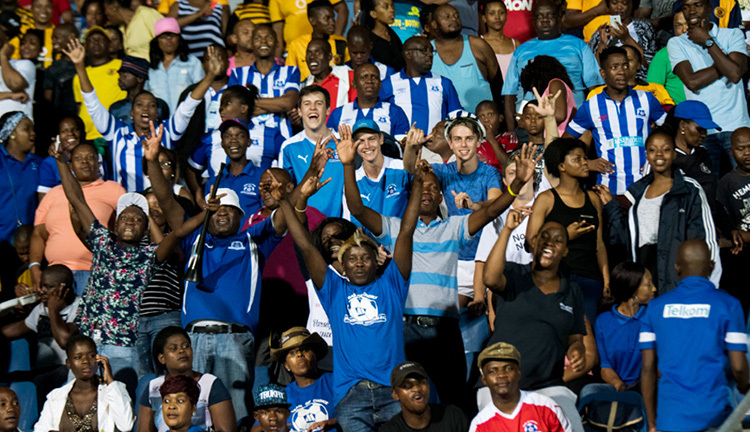 Maritzburg United were back to their scintillating best on Friday night as they saw off Polokwane City 3-1 in an Absa Premiership match at a packed Harry Gwala Stadium. The home side netted through Thabiso Kutumela, who netted a brace, and Mohau Mokate, and could have added to the scoreline had they taken several other good chances they created on the night. Buoyed by the large turnout of home fans, the Team of Choice looked bright early on, playing some incisive passing football on the front foot. And their efforts were rewarded after just four minutes as Polokwane goalkeeper George Chigova only managed to parry Siphelele Ndlovu's stinging shot, which allowed Kutumela to steer home a close range header to send the fans into rapture. Although Rise and Shine had a couple of sniffs at goal, United kept their foot on the pedal and they were close to adding a second goal just 10 minutes later when Kutumela's cross located Mokate, but his header flashed marginally wide of the post. At the other end, and Bongile Booi was not far off with a header from a Jabulani Malueleke free kick on 18 minutes. There was however a real swagger to Maritzburg's attack and they doubled their lead in the 26th minute when Miguel Timm played in Man-of-the-Match Fortune Makaringe, who sent in an inch perfect low cross for Mokate to guide home in from six yards out. Makaringe was at his scintillating best and played in a lovely pass to release Ndlovu 12 minutes later, but the latter fired over the bar. The visitors came fighting back towards the end of the first half and after Bongile Booi had gone close with a curling effort, Brian Onyango made a superb tackle to stop the same plaer from pulling the trigger. It took the Team of Choice just five second half minutes to add to their tally as Makaringe combined superbly with a couple of players to find space down the right and then played in an inch-perfect ball for Kutumela, who finished very well with a first-time shot at the near post. Polokwane City however rallied back and Mashumba was left unmarked at the back post to head home a Booi cross. Maritzburg however showed plenty of character as they took the fight back to Rise and Shine, and the hosts were close to adding more goals as Kutumela went close with a free kick before Ndlovu just missed latching onto a Makaringe cross. Chigova then came up with a brilliant reflex save to keep Judas Moseamedi from scoring after a lovely build-up, before Makaringe fired a shot into the side-netting with 15 minutes to go. Maritzburg had some nervy moments in the closing minutes as they found themselves camped near their own box, but thanks to a couple of saves from Richard Ofori, they made it through to full time with the 3-1 scoreline intact. Subs: Mpandle, Allie, Matsi. Zakri. Figareido, Moseamedi, Mekoa. Polokwane: Chigova, Mbonani, Nkili, Phiri, Kalake, Hlongwane, J.Maluleke, W.Maluleke, Seabi, Anas, Booi. Subs: Phali, Wagaba, Mphambaniso, Sikhosana, Musona, Baloyi, Mashumba.